Yesterday was officially the last day of summer, although it felt like summer left us last week. I am not quite ready for Autumn, actually I am not a fan of the cold so I am dreading the long winter ahead of us. Today as we welcome the first day of Fall, I want to look back on my summer of '11. 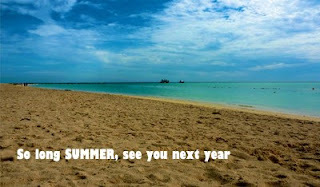 Hope you also had a wonderful summer! What are some of your summer favorites and most memorable moments? i don't mind the fall but i totally dread the winter. i actually like fall clothes and fashion but i wish after fall, it would go back to summer because i lurve the summer! fav summer moments: AS vegas trip of course, starting our basement renos (so glad they're done! ), outings with the family to wonderland, the petting zoo etc; happy hour fridays! I like this post - especially because I know how much you like summer. and you really can't go wrong with chips & salsa. yummo.